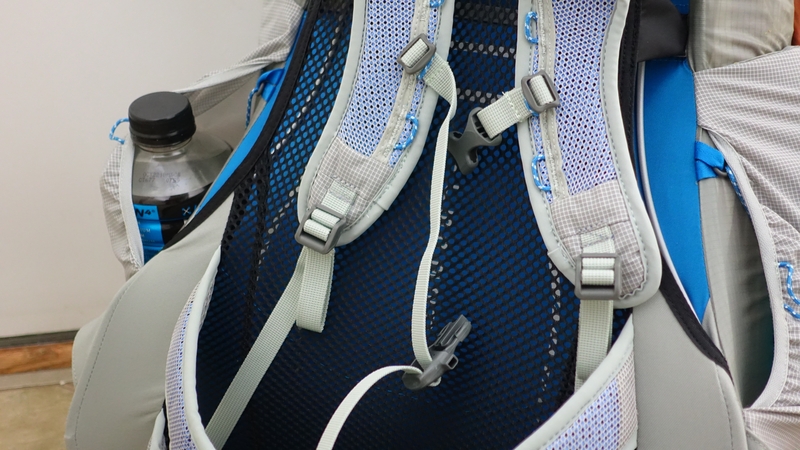 The packs use Osprey’s Nanofly 210D nylon fabric technology on the bottom and top parts of the bag, which boasts high resistance to abrasion, water and UV light degradation. But they also use a much lighter silicone impregnated nylon for the main compartment, which is what many tent floors are typically made of. The combination of fabrics are intended to allow the pack to be as light as possible without sacrificing durability. 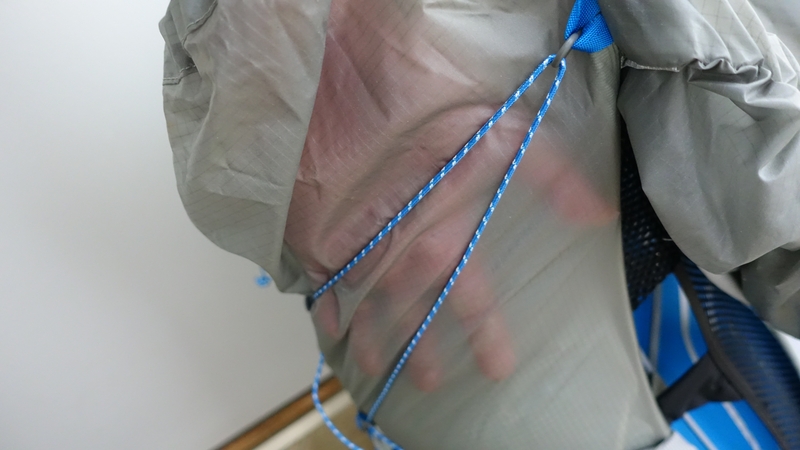 However, the silnylon fabric is thin enough to see through and feels somewhat fragile. Also included is Osprey’s excellent suspension system, with the Ultralight Airspeed back panel and Exoform harness. The suspension system is what Osprey has done very well throughout the years and this technology has been seamlessly integrated into the Levity and Lumina. The bag is a pleasure to carry and the sizing fit perfectly for my measured torso length. 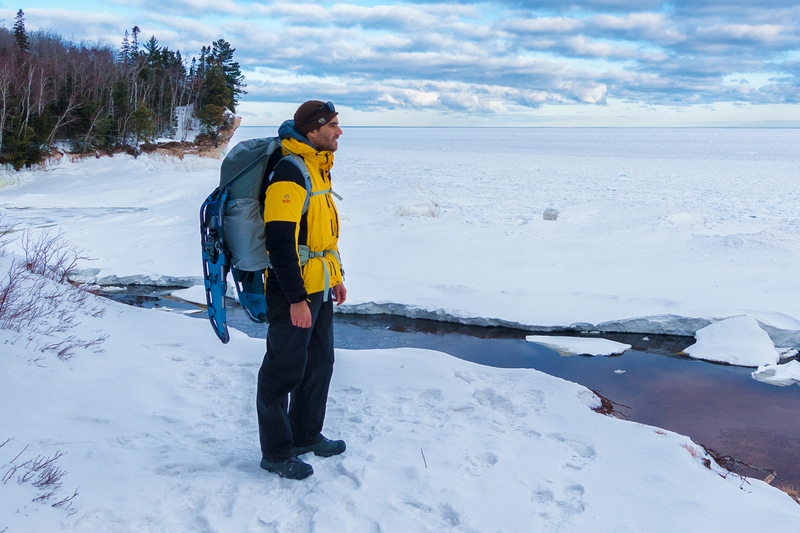 Winter is a hard time to field test equipment in the Upper Midwest, but I was able to get out on an overnight backpacking trip at Pictured Rocks National Lakeshore in the Upper Peninsula of Michigan. I also went on several day hikes of varying lengths with my full kit. I was carrying 25 pounds of winter gear and supplies which was below the maximum intended weight of 30 pounds for the 60L option. First, the best part about this pack is the way it feels when you wear it, even with a full load. I used Osprey’s size selection chart which put me into a medium torso length, and the fit was spot on. The waist straps fit snugly on my hips and the assortment of shoulder straps made it possible to keep the the load on my hips and not on my shoulders. After seven miles of hiking through snow, I did not have any discomfort in my back or shoulders. I can confidently say this is one of the most comfortable packs I’ve ever worn. The bag comes with a generous external compartment which is nice for storing items you would want easy access to, although I wish the fabric was able to stretch a little more. Additionally, the straps used for closing and cynching the pack are easy to use and of minimalist design, employing a combination of corded and standard straps that close and compact the pack nicely. At first it may appear the straps are over-designed, but once you get the feel for how they work together they become easy and practical to use. The main compartment of the bag is plenty big to store gear and food and I had no problem loading it up with heavier, winter gear. 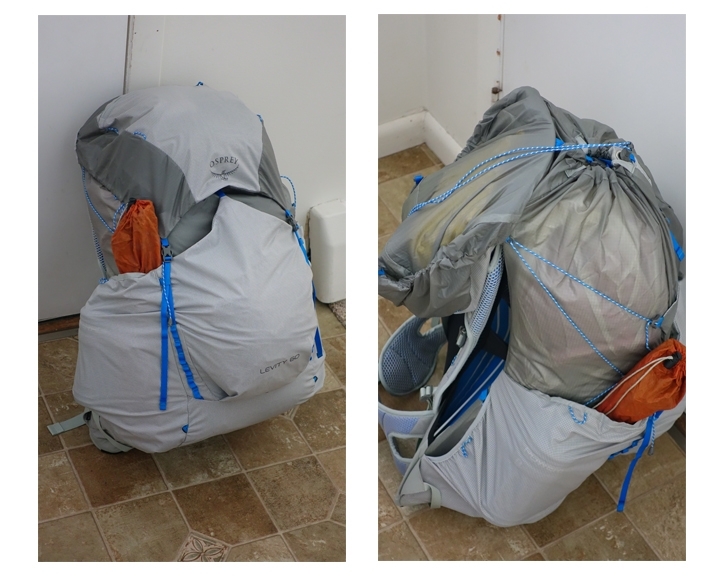 For summer hikes with lighter gear I suspect the 45L bag would be a great option for ultralight hikers. Despite how great the bag feels to wear, there are some aspects about the pack I wasn’t thrilled with. For starters, the side pockets (for water bottles, etc.) are very difficult to use. I tend to carry Powerade bottles when I hike and it was nearly impossible to take-out and replace my water bottle while walking. A thinner bottle (like SmartWater or similar) may work better with the shape of the side pockets. One thing Osprey can’t seem to get away from is the “brain” compartment they put on thier packs. In this iteration, it is smaller than some of their prior offerings, and is also something that you can’t completely remove anymore. It functions more like a top pocket than a separate compartment, and I found it more annoying than useful as it adds an extra step to getting into the main compartment of the bag. Additionally, there are no pockets on the shoulder straps or hip belt. This is perhaps more of a personal pet peeve, but having an option to store a quick snack or a place to hold an easily accessible phone or camera is a big plus. Lastly, I am worried about the silnylon material the main compartment of the bag is made out of. It feels delicate and susceptible to abrasion if handled harshly or filled with sharp or obtuse objects. I had no issues on my short time with the pack but it is something to be aware of if you are someone that may be harsh with their gear or just traveling through thickly forested woods where branches have the potential to contact the bag frequently. The amount of features contained in this pack compared to its sub two-pound weight is impressive. For ultralight enthusiasts who value a dedicated, robust suspension system, this bag was designed for you. For everyone else, there are other options that may be a better fit, like Granite Gear’s Crown V.C. 60 (60L, $199, 2lb 4oz), ULA’s Ohm 2.0 (63L, $210, 2lb 2.5 oz), or even Osprey’s Exos 58 (58L, $220, 2lb 10oz). All of these are significantly cheaper than the Levity/Lumina with minor weight penalties due in part to heavier, more robust fabrics. Additionally, if you are looking to go as light as possible, there are many excellent Cuben Fiber packs such as ZPacks Arc Blast (55L, $325, 1lb 5 oz) and Mountain Laurel Designs Exodus 57 (57L, $270, 15 oz) that can get you better weight performance in the same price range as the Levity/Lumina. In closing, I applaud Osprey’s ingenuity in pushing their packs into a sub two-pound category. It is a great pack that unfortunately loses points on an awkward top brain compartment, difficult-to-use water bottle pockets, and lack of hip or shoulder pockets. If you are an ultralight hiker that values a full suspension backpack then this is the best pack you’ll likely find in this category and a pack you will undoubtedly appreciate and enjoy. I had trouble getting my water bottle in and out of my Lumina at first but found if I stashed my tent in the side pocket then it helped hold a space open for me to easily slide my bottle back into the pocket (700ml smart water bottle). Still playing around with the best way to pack everything but happy with it so far! Been using this bag for 5 weeks on the AT now. Unfortunately when you tighten the hipbelt (over time) it is developing a bit of a knot that’s right on the hip bone. Of course this is very annoying. Osprey doesn’t respond to email about this. Hmmmm not the right customer service you’d expect. Now using the bag with a buff on each side. Can you please give us an update on your experience with the pack? Thanks.